The Gallery on High is collecting recyclables for spring art show! You can drop off these items during their regular business hours: Tues-Friday from 10am to 4:30pm and Saturday from 10am to 3pm. *Please make sure each item is rinsed and cleaned of its original contents. When the news of this play came through, I pulled my copy off the shelf and re-read it, and it is such a delight and tragic at the same time. There are two characters – Melissa and Andy – and the entire course of their relationship is told in letters that they write to one another over the years, beginning in childhood. The letters are meant to be read from one character to the other, and the set is simple. This is an excellent choice by John and Nancy Dolan for Valentine’s Day! Why not plan to make a date night of it and support the Elks at the same time? Check out the details below on the classes. Students can register online at www.galleryonhigh.org, over the phone at 610-326-2506, or in person at 254 E. High St. Remember classes must meet minimum enrollments in order to run. Don’t miss out—register today! Students will explore the three-dimensional and crafty arts in this fun 12 week class. We will work with a wide variety of mediums including mosaics, glass fusing, paper crafting, beads and more. Minimum 4 students. All supplies included. WINTER/SPRING SESSION begins Wednesday, February 1 and runs from 4:30-6pm for 12 weeks. $150 (members), $165 (non-members). Beginner through advanced students will work in various media to develop their skills in drawing and painting. Each week students will work from various studio still-life arrangements. Students are encouraged to apply different painting techniques ranging from short studies to a finished painting. Students will need to bring their own supplies. Supplies can also be purchased the first day of class. WINTER/SPRING SESSION begins February 7. Class runs Tuesdays from 9:30am-noon for 10 weeks. $150 (members), $170 (non-members). Students will learn the basics of wedging, centering, raising and shaping as well as slab-rolling and hand-building. Students will receive individual instruction based on their skill level. This class is limited to 10 students. Cost includes: 25lb bag of white clay, 1 bisque firing and 1 glaze firing, and all glazes. WINTER/SPRING SESSION begins February 4. Class runs Saturdays from 1-3pm for 8 weeks $180 (member), $200 (non-member). Learn the indirect method of creating beautiful mosaics with vitreous glass. Make an 8 inch by 10 inch mosaic suitable for framing in a standard size frame. This class is good for beginners and for those with some experience as well. There is a $10 materials fee, payable to your instructor at the first class. On class days that run from 10am-3pm, we will take a half hour lunch break. Minimum 4 students. WINTER/SPRING SESSION Class runs Saturday, February 11 and 18 from 10am-3pm and Saturday, February 25 from 10am-1pm. $110 + supply fee (member), $120 + supply fee (non-member). Students will learn the basics of making fused glass jewelry. We will make three dichroic glass pendants using three different fusing processes. This is a great class for jewelry makers who want to enhance their design with one-of-a-kind pendants. It is also a great introduction to the fun world of fused glass. There is a $40 fee for supplies and firing, payable to the instructor. WINTER/SPRING SESSION Thursday, February 16 from 6-9pm. $55 + supply fee (member), $60 + supply fee (non-member). Juan Carlos dinner specials and don’t forget Sunday brunch! This weekend Juan Carlos is featuring some truly special dishes in addition to their regular menu. Also, don’t forget that Juan Carlos is open for Sunday Brunch between 9am and 1pm! Juan Carlos is a BYOB restaurant located at 235 E. High Street, Pottstown, PA 19464. Their number is 484/624-4931. Visit them on the web at jcmexicanfood.com. *Jalisco Style Broiled Flounder– Lightly spiced broiled flounder topped with our traditional tomatillo sauce, cilantro, lime wedge and pico de gallo. Served with rice, Cuban style beans and corn tortillas. $16 (Typically this style of fish is eaten in a taco). Pottstown SCORE is currently accepting registrations for its timely workshop series, “Using Social Media to Make Your Business Grow.” This workshop series will be held at the Tri-County Area Chamber of Commerce Conference Center, 152 E. High Street, Suite 360, Pottstown from 7-9:30 pm on four consecutive Monday evenings in March. Registration begins at 6:45 pm. Attendees will learn that Social Media is a lot more than Facebook pages and a few Tweets. It’s about understanding the total marketing conversion strategy; the psychological hot buttons of different demographics; how to take on the challenge of integrating social media into an overall marketing strategy; and how to measure its effectiveness. The workshop series, presented by SCORE, “Counselors to America’s Business” is not only for those who are currently in business, but also for any interested individual who would like to better understand how to use social media more effectively. The following experts in the field of social media technology and marketing will be presenting the workshops: Jeff Kofsky, President of Higher Vision Coaching and Consulting; Brian Dainis, President of Curotec, LLC, a web design, marketing and SEO company; Joy Sorrentino, a prominent social media consultant and blogger; Drew Griffin, Founder of Mojo Digital companies, LLC which delivers value through social media, video and mobile marketing; and David Yunghans, the regional development director for Constant Contact. March 26—eMail and Social Media—Are They Married Yet? The price of each individual workshop is $40, and there is a special package price of $140 for the entire 4 sessions. Additionally, there is a 50% discount for another person from the same company attending. Since this is such a timely topic, it is anticipated that classes will fill up early. To guarantee a seat, please pre-register online at www.pottstownscore.org or phone the SCORE office at 610-327-2673. The SCORE workshop instructors welcome your questions and are anxious to help you get started on a successful social media marketing strategy which will grow your business. Goldilocks and the Down Home Bears at Tri-PAC this weekend only! Some bears hibernate for the winter, but not the bears at the Tri-County Performing Arts Center, 245 E. High Street, Pottstown! They’re singin’ and dancin’ in the foot-stomping musical GOLDILOCKS AND THE DOWN HOME BEARS! There are only three performances of this musical, Saturday January 28th and Sunday January 29th, so get your tickets now while there is still time! Come down to the holler to meet Goldie (Goldilocks) who is just about to celebrate the birthday that will make her a teenager. And what does she do? She runs away from her home and her strict parents, only to find the country cottage of the most fun lovin’, partyin’ three bears you ever did see. 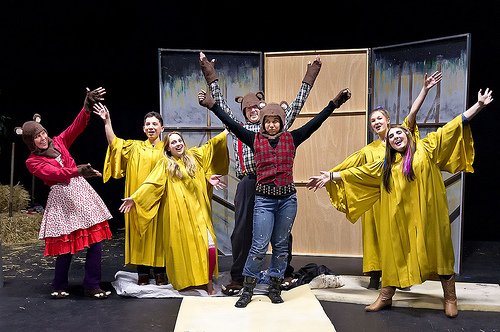 A down home musical for the entire family (especially for ages 5 – 12), GOLDILOCKS AND THE DOWNHOME BEARS celebrates family and friendships, and the joys and challenges of growing up for both kids AND parents! The book and music was written by Neal and Karen Newman. The cast includes Maddie Aicher, Joseph Ciresi, Rachel Julian, Lindsay Lohr, Deedee Mann, Allen Puy, AJ Sermarini, Jordan Shoemaker, Rebecca Shoemaker, Eric Thompson, and Paulina Wozniak. This production is available for school groups and organizations at the Tri-PAC or off-site from February through May. It is a great way to bring a fun, educational offering to your school or club. Contact Education Director Steve Reazor at steve@villageproductions.org for more information on how take advantage of this show. There will matinee performances on Saturday, January 28th at 11 AM and 3 PM, and again on Sunday, January 29th at 3 PM only. Tickets are $17 for adults, $15 for students and seniors, and $13 for children 12 and under. Tickets may be purchased at www.tripac.org, or at the door the night of the show if available. As always, there are discounts for groups of 10 or more. Check our website, or call the theater at 610-970-1199 for more information. There is plenty of excitement ahead, with “Ain’t Misbehavin”, “Toys In The Attic”, “Farragut North”, performances by the Melange Contemporary Dance Company and the Senior Follies, all leading up to our June musical “Hairspray”. There’s something for everyone at the Tri-County Performing Arts Center! PDIDA holding meeting tonight for downtown merchants – please attend, if you can! *All of this requires help – Please join in the efforts! What are your issues and concerns? What are your suggestions going forward? Mosaic Community Land Trust is holding an Open Mic Night tomorrow, Saturday, January 21 from 7-11 pm at their office and gallery at 10 South Hanover Street, Pottstown, PA. I expect to be reading a memoir/essay that involves Funky Lil Kitchen, Princess Di, a dust rag, and the first love of my life. Oh, yes. I will do it. Come watch the magic unfold or, better yet, sign up to pull off your own magic. If you’re planning to perform music, read, or recite poetry, please arrive at 6:30 pm to register. Each performer will have 20 minutes. Any questions, contact Alan Sellers at 267-244-3195 or e-n3vxy@comcast.net. Open Hearth Dessert Demonstration at Pottsgrove Manor this Saturday – Yum! 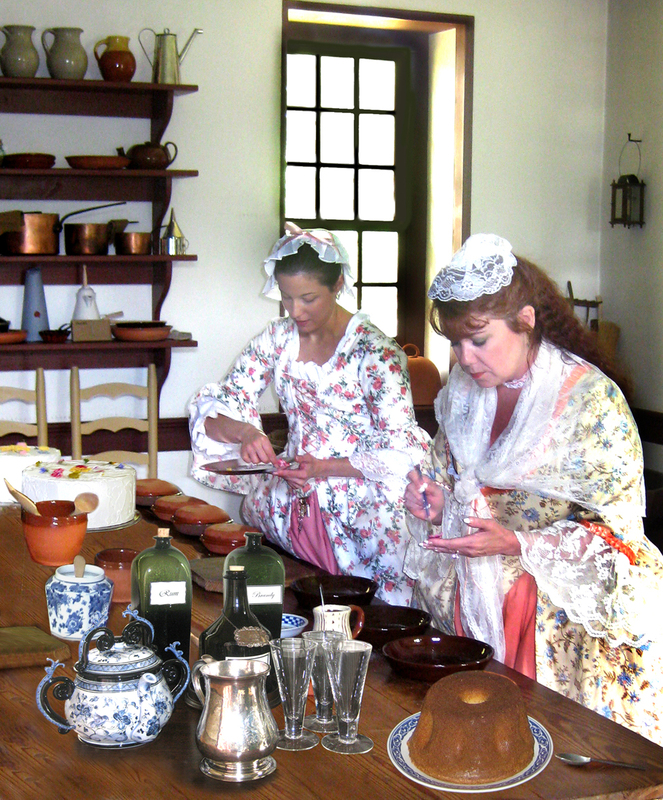 This open-hearth cooking demonstration will feature Pottsgrove Manor’s historic cooks preparing authentic 18th century recipes for sweets and treats made with a variety of libations. This program wraps up the exhibit “Spirituous Liquors and Healthful Distillations: Alcohol in Colonial America.” Visitors can take a tour of the exhibit during their visit; this will be one of the last opportunities to see the exhibit before it closes on January 29th. For more information and a full calendar of events, visit them on the web at http://historicsites.montcopa.org/pottsgrovemanor.